The Pershing II missile was designed as a direct counter to the Soviet Intermediate Range Missile, the SS-20. The deployment of 108 of these missiles in West Germany, Italy and the United Kingdom proved a major test for NATO’s resolve. Public protests against the deployments were massive. However, despite the strains, the weapons were deployed, providing NATO with a bargaining chip in the proposed Intermediate range Nuclear Forces (INF) treaty discussions. These negotiations had been suspended in 1983, and the successful deployment of the Pershing II’s provided impetus for restarting the talks in 1985. Ultimately, the talks would succeed at the Reykjavik summit in Iceland in 1986. Like a much weaker Socialist Governments, except with a 1 VP bonus and not cancellable by The Iron Lady. It is worth playing if the VP matters for Wargames or if the influence loss affects scoring. A decent headline in the Late War. If your European countries are overcontrolled (and you have nothing to fear from the event), then it’s often worth losing a VP to have 3 Ops. But if you’re just going to spend your Action Round repairing the damage done by the event, you may as well send this to space and save the VP. 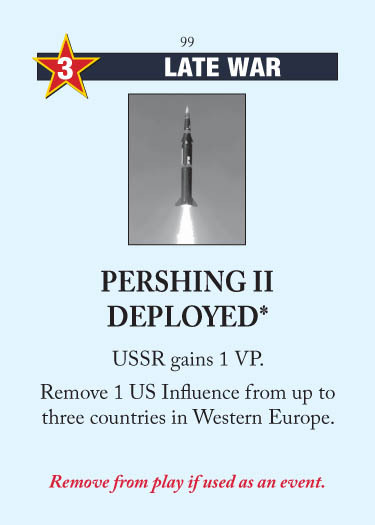 This entry was posted in Late War, USSR Events and tagged pershing ii deployed. Bookmark the permalink. That card won me a battle for Europe control in final scoring because I was able to steal last action round of USA by boosted Terrorism card. It allowed to break control of 3 European countries – right what I needed for control (8-10 turned into 8-7 in countries controlled).